Shiva has begun a new behaviour that has inspired my curiosity. I’m not overly worried about it yet as it doesn’t appear to be related to anxiety or reactivity. However, I am not really sure what it means and could be wrong. It’s nothing she has ever done before and I am hoping there may be someone out there who can enlighten me as to the cause of this odd little action. 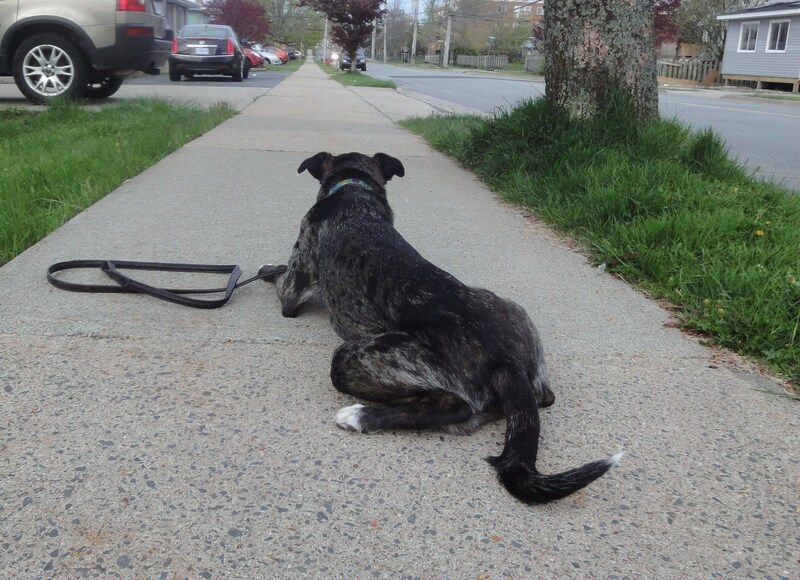 Now that the warmer weather has arrived there have been a lot more dogs out on the streets. This used to make me a little resentful as I felt if people couldn’t walk their dogs all winter long they had no right to be bugging us the instant the temperatures started to climb. This year my attitude toward such interlopers has changed. Now I just few the increased sidewalk traffic as a challenge. Our record so far is five. We came close to more but Shiva just couldn’t resist a happy, wriggly Golden Retriever puppy. I couldn’t blame her too much for that one. Much to my surprise and delight, these days Shiva is more often the lungee. Almost every walk now I am complimented in some way for her calm demeanor around other dogs. It always makes me laugh. Of course, as soon as someone says something Shiva does her best to prove them wrong, yanking me off my feet to go sniff at a random piece of paper. Shiva has been lunged at a few times in the last few weeks while on leash. Most of the time it’s not a problem because I can see the dog is about to make a run for it ahead of time and am prepared. Her reactivity toward other dogs has all but vanished as long as the other dog is just another goofball like her. Luckily we haven’t had to find out what she’ll do if the other dog isn’t just a mannerless pal. However, when these other dogs have started to ran at her to say hello, Shiva has taken to dropping immediately to the ground. And I can’t get her to stand or even look at me, not even if I throw a treat at her head. She just lays down on the spot and stares. It’s creepy. It’s not with all approaching dogs, only the ones who have broken from their owners and ran towards her. And only when she is on a leash. Nothing happens afterwards. Once the dog gets to her she leaps up either into a play bow or starts sniffing. The tension completely disappears. Still, it weirds me out. I can’t help but wonder if the laying down is a sign of stress or an attempt at a calming signal. Or maybe she is just so excited that she has to quiet herself or she’ll burst? Have you ever witnessed behaviour like this before? Is it something we should worry about? Just when I think I understand all of Shiva’s little quirks, she pulls out a new one. I swear she does it just to keep me guessing. haven’t seen a behavior like that… but it doesn’t seems to be a disruptive behavior. If anyone knows better, do share. Kobi does this all the time!!! I always thought it was another funny border collie quirk. He doesn’t always do it when meeting another dog, but he does seem to do it to younger dogs. If he seems them approaching he will drop right to the ground and stare, but the second the dog comes up to say hello he pops up and tries to play. I think it’s just that, a play behaviour. But it is weird that nothing breaks his focus when this happens, he gets right into a weird little zone where he gets approaching dog tunnel vision. It is weird that nothing breaks his focus when this happens, he gets right into a weird little zone where he gets approaching dog tunnel vision. Yep I have seen it too… I think your best guide is to note how she is after she does this. If it has all pretty much been positive then don’t worry too much about it. Some dogs will do this when they are automatically going on the submissive because that dog to them appears to be so forward (charging towards her)… others will do it as a sort of pounce position. The pounce one is one to simply be watchful of for intentions. If a dog springs up like that and the other dog was not ready for it or not wanting such a enthusiastic introduction they could spat with her over it. If it becomes an issue maybe you could simply step in front of Shiva to sort of intercept the dog that is coming up to slow them down. I do this anytime I am out anyhow simply to protect Luna where I can (Can you tell I don’t trust most other dogs). 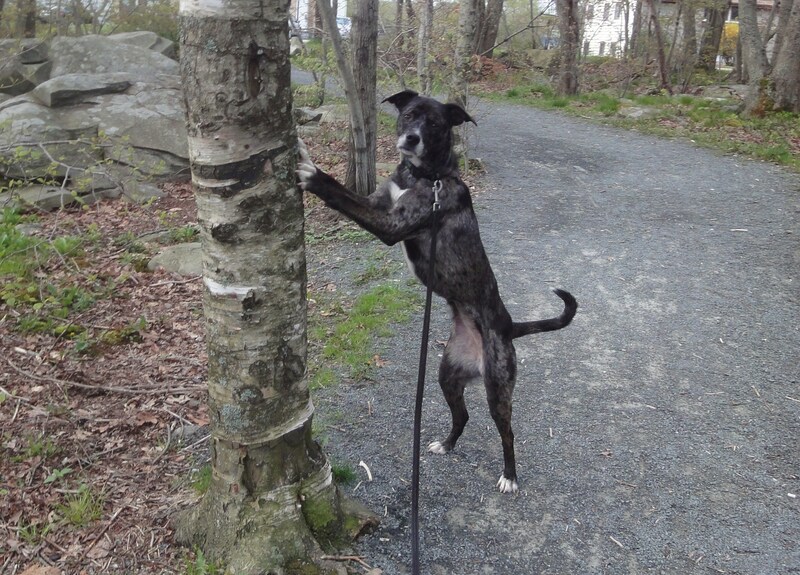 At first with your first picture I thought you were going to tell us she started eating tree bark… Luna’s family does that, but thankfully she never picked up the habit. Maybe she’s trying to let the approaching dog know she’s not a threat to them? Yeah, I tend to think of it as a calming behaviour. Mufaasa does this, especially if I slow him down when approaching another dog, or if he’s pulling and stop all forward momentum to get him to stop pulling. I also see him do it at the park if we were the only one’s there and he sees another dog coming in. Even if we were playing ball he’ll lie down and wait for the other dog to enter, and when they get close jump to his feet and greets them (all wiggly and loose bodied, so it doesn’t really bother me). It’s extra funny when the dog does it back, since it takes them like 10 minutes to close the distance, but it’s never, ever erupted into any sort of rude meetings, just the opposite. If Shiva comes out of it with a play bow, I’d say it’s a calming signal, and I’d be pretty happy about it. My guess would be that it is a submissive behavior, but without actually seeing it, it is hard to say for sure. She may being showing the approaching dog that she is not a threat and once the dog gets to her, it is playtime and she reacts accordingly. With the stare and the body posture I don’t think it’s a calming signal… without the stare, perhaps. I aslo don’t think it’s an insecure/cut-off signal (a “tap-out” sometimes seen as submission) again because of the intense stare–the stare is anything but a ‘tap out’. I HAVE seen some dogs, who were at one time “friendly reactive”, start doing this as a way of having some impulse control. They recognize that barking and lunging on leash doesn’t get them what they want… but it’s HARD for them not to do this so they will pounce into an intense down (a very committed stationary behavior) …practically shaking trying to control themselves until the other pup gets there and they say “OKAY I CAN PLAY!”. I’m not a dog trainer, but I think it is Shiva’s way of letting the other dog know that she is not a threat. I’ve seen this happen with an off-leash dog in our forest/park. We were approaching with Delilah on leash and this little lab dog came running down and just dropped. He/She just laid there looking at us and then my dogs approached and he/she jumped up for greeting. I kind of wish Our Best Friend would drop to the ground when another dog approaches. At almost 70 pounds, it’s hard to control a lunging, fearful, reactive dog. You wouldn’t know anything about THAT, would you? I haven’t seen that myself, but maybe it is some kind of calming signal towards the other dogs. Dogs are such a puzzle, aren’t they. Another time where you wish they could talk. This though, is great: “Look how nice that dog is walking,” I’ll hear someone say to their rambunctious canine. “Why can’t you do that?” Isn’t it nice when all your hard work starts to pay off? Even if sometimes she likes to keep you on your toes, for the most part – she has come a very long way. Nice Job! Ha – Blueberry does this when we come across a horse and its rider. I think it’s just a submissive behavior to appear non-threatening. She’s a rescue so I don’t know how she learned this behavior – but I just let her be. She isn’t stressed or anything – it’s just something she does and probably diffuses the situation with Shiva and other dogs that are running towards her. It could be in her bag of tricks to weird you out with yet another behavior, but I would guess if there is logic she is showing that she is not a threat. Interesting. I know Stella does that sometimes when Oly comes charging at her at full speed, but that’s because Stella knows that if she doesn’t hunker down it’s highly likely Oly is going to knock her down. Maybe that’s just Shiva’s safe stance while she waits to see what kind of dog is approaching her at warp wiggle speed? Gosh, I don’t have a definitive answer–but I have seen that before. Especially from border collies! I’m really isrmesped with your writing skills and also with the layout on your weblog. Is this a paid theme or did you customize it yourself? Anyway keep up the excellent quality writing, it’s rare to see a great blog like this one nowadays..
I’d think it’s a way Shiva calms the other dog. As soon as that dog relaxes she’s up and friendly. I don’t have any words of wisdom. But I did recently see a post of someone trying to understand similar behavior from her dog. Maybe you want to compare notes? From what I’ve witnessed with my own dogs it is a play behavior. Kind of like play stalking invitation. My dogs do it all the time with each other. At least that’s what it sounds like to me. I’ve also seen it before in herding dogs as part of instinctive hearding or stalking behaviour, but being new for Shiva, I’m pretty stumped. Some of the other suggestions about being non-threatening and ready for play are probably pretty likely. Is there any common factor with the dogs she does this to? Excitement? Eye contact? Leash tension? So puzzling! Exactly what behavior in the other dog triggers ambush mode we haven’t figured out, as she will sometimes pick out her victim from across the dog park. She lies in wait until they come close to her, or until it becomes obvious that they aren’t going to come anywhere near her. At that point, she most often jumps up and zooms after the other dog. (We have almost always warned the other owner by this point.) Sometimes, though, if the dog isn’t coming near her and obviously hasn’t even noticed her, her pounce position becomes a nice lie in the dirt and relax for a little bit position. I will note that I have not seen this behavior go bad. I’ve seen it from June and other dogs at the dog park, and it has never led to an incident. Very interesting – this is much better than lunging, coming from the owner of another lunger. I’ve seen dogs do this at the dog park but never really understood what it meant. It looks like you’ve gotten some great advice in the comments. I’m so happy for you that Shiva has developed a new (and less dangerous for your rotator cuff) behavior. Great work on the training! I have seen this before at the vet’s with an excited dog. I will see them sitting nicely in the waiting room and then when I start approaching they lay flat down, then as I right in front of them they leap up and start wagging and sniffing. I would have to believe that it is a calming signal 🙂 She is such a cutie!! My dog does this and it’s definately not a submissive thing. What is her background? Was she a working dog? Mine’s a Border Collie and was previously a working sheepdog. He had “difficulties” during his training and ended up in rescue (lucky me!). He drops and gives “the eye” as they call it. He stares down other dogs, cars, and sometimes people. When they get close he lunges and barks and growls. If he’s off the lead he just wants to play….it’s weird. I’m trying to train it out of him but it’s notoriously hard to reverse as it’s bred into them. If you haven’t had her from a pup, I’d make enquiries into what she’s previously been used for. in Internet Explorer, it’s got some overlaoping issues. we want develop extra techniques on this regard, thank you for sharing.